I love this verse! Whenever I read it it always makes me feel so safe! 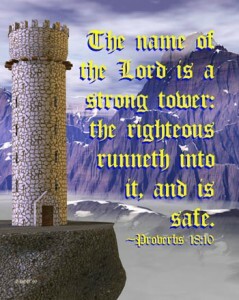 It reminds me that there is strength and protection in the name of the LORD and we believers, those who are righteous because of Christ, can run to the Lord in time of trouble and be kept safe. We can call upon His name, run to Him in times of trouble, and rest assured that He will keep us safe.